Penny Wells has a passion for touring Australia second to none. With countless numbers of Long Haul Touring Trips under her belt, her enthusiasm for sharing some of the most gorgeous locations on this planet is infectious. Finding herself at home in areas so remote that they aren't even named is what this lady lives for. Keen to get behind the wheel of anything on two or four wheels, Penny brings an air of grace to typically all boys activities. But not one to sit back and watch others, she will usually be found shoulder deep in the thick of it, and giving the boys one hell of a run for their money. To say Jimmy is passionate about four wheel driving would be putting it mildly. When the hubs are locked in, Jimmy is in his “happy place”. Coming from competition spec 4wd skills, this bloke can drive! Best mate to Penny, they have shared over the years many adventures off screen. But now in front of the camera, Jimmy brings his fun, easy going nature to life. Touring in a tuff single cab Landcruiser 79 series, there is never a dull moment with Jimmy around! Never wasting a moment to get behind the wheel of her fourby, Tia has crafted a lifestyle that maximises her time outdoors. Living by her mantra that fresh air and new adventures lead to a life full of memories, finds Tia in some remarkable situations. Definitely the 'outdoorsy' type, Tia enjoys motorbike riding, mixed martial arts and photography. Freely admitting to a fear of spiders, not all creatures are welcome in Tia's swag! Watch Tia in series #4 as she embraces unique places and new faces. Fun loving Nikki enjoy's a challenge so when we asked her to join us on an expedition, she jumped at the chance. 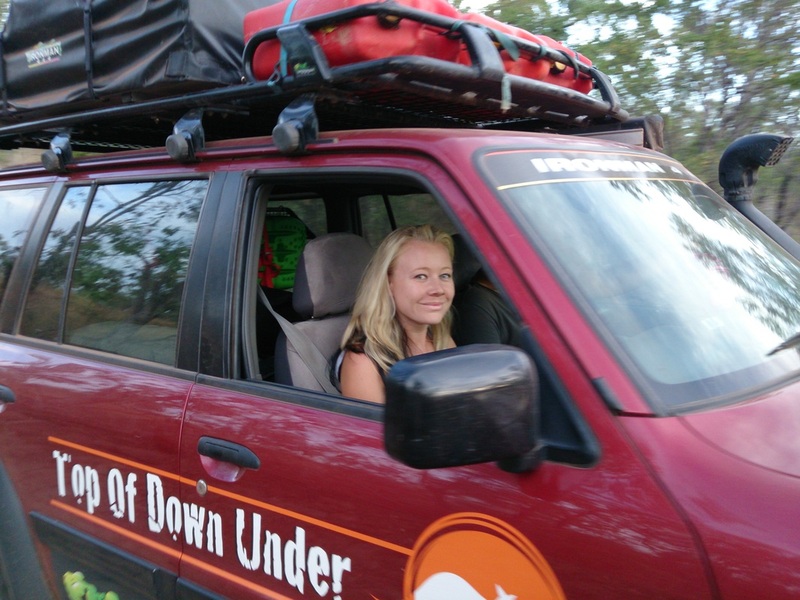 Driving our trusty red Nissan through remote Australia, Nikki has valiantly proved that anyone can satisfy their inner travel bug and tour down under. To chillax Nikki loves nothing better than a sun bake on the beach and the splash of waves on her toes. Keep an eye out for Nikki in series #4 as she begins a journey like none other before! Jodie Dalrymple brings an exciting new personality to the Discover Oz Crew. With a background in Sales, some may have thought she would be a fish out of water as a Four Wheel Driver Tourer. But quite to the contrary, Jodie is a keen camper, and loves motorbike riding, and was quick to put her hand up to join her new hubby Jarad Dalrymple (camera 2) on the road and having a key role in filming the latest "Top of Down Under" series. 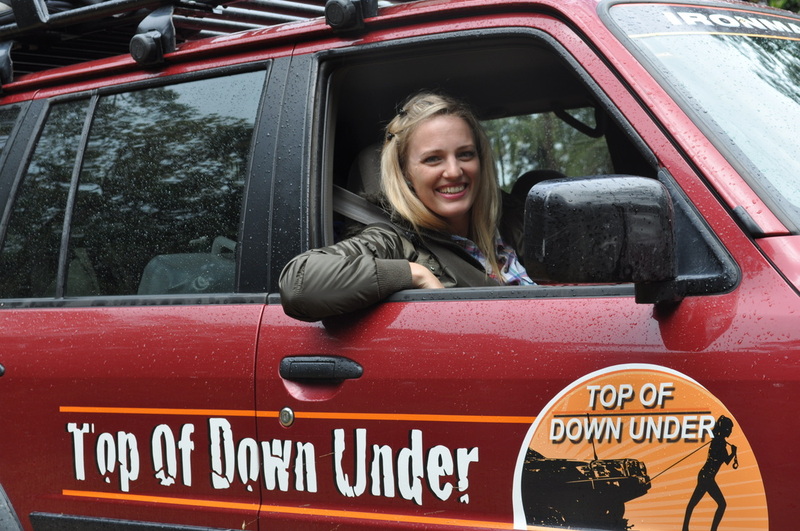 With no off-road experience to speak of but a strong love of everything outdoors, Jodie has became Penny's partner in adventure during series 2 and 3.